Suzie Black is an artist who creates abstract-expressionist works, which effortlessly blend the world of the material with the world of the spiritual. She received her formal training at George Washington University and the Corcoran School of Art, and received advanced degrees in both Art Therapy and Art Education. Her style is creative, colorful, fun and thought-provoking. She was born in Essex County, New Jersey, and now lives in Scottsdale, Arizona, with her husband Dave. She has two adult children, David – a lawyer, and Allie, a proud new parent of Suzie’s first grandchild. Suzie started painting as a child. One day, unbeknownst to her mother (an interior designer and painter), Suzie stole into the family studio and, with oils and canvas at hand, she created her first work. 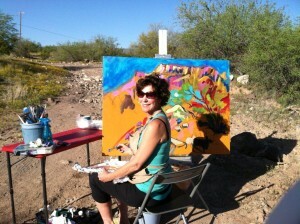 From that moment until now, she has pursued her love of art and color. As a student and teacher alike, Suzie has created true works of art. These colorful works have been shown and sold in galleries across the US. For more information, Suzie can be reached at (602) 799-3861.